Getting ready for breastfeeding I had done so much work, but I still felt that I wasn't really prepared for what happened to me. Despite the fact that I had a small amount of training at university about how to help breastfeeding mothers (which I've since gone and improved!) and the fact that I did a full day course with my local breastfeeding association, I still fell into several of the most common traps! If you are newly pregnant and looking for breastfeeding information you are all the more likely to succeed in your ambition to breastfeed. Hopefully I can say some things in a different way which will help you not have the same problems I had. 1 - To establish breastfeeding in the easiest way possible, it should begin within an hour of the birth. This means you may need to talk to your midwife or obstetrician about having skin on skin contact immediately after the birth until the first feed occurs. This gives your baby an opportunity to do a baby led attachment. Make sure your birth plan includes this time and skin to skin contact, and also provide for the possibility of problems (such as your baby needing to be in special care or you needing to be separated from your baby for some reason). Make sure your midwife, obstetrician, birth partner (husband, friend, mother etc) know that you would prefer to express your own milk and colostrum if your baby needs special care in the first hours of their life and that you don't give permission for formula to be given to your without further consultation with you. If you don't get the chance for that skin to skin contact or for some reason things don't go as planned you can still do baby led attachment for the first 12 weeks so give it a go again if you are having nay problems. 2 - Your support network Is your most important thing. Research shows that mothers who are well supported to breastfeed are far more likely to reach their exclusive breastfeeding goals. I really believe that the fact that my husband didn't ask me if he should go out and buy formula, but instead knew that I wanted to breastfeed and helped me through the hard times with a reassuring pat and smile, a nice meal, a call to our lactation consultant really made a big difference. 3 - Know the most common breastfeeding problems and how can you avoid or deal with them as they arise? My biggest mistake was not taking off my baby and reattaching him when his latch wasn't right. I'd been shown by a midwife how to reposition his lips without taking him off, and despite being told repeatedly whilst getting ready for breastfeeding in my preparation class that you should always take them off, I was in a position of vulnerability and had a person of authority who I naturally trusted tell me something else. This was my biggest mistake, and I really hope that you can get a better latch on than I did, because a month of painful breastfeeding was pretty hard work. 4 - What type of breastfeeding clothing will make breastfeeding in public easiest and how much can you acquire before the birth? What type of bra is best for public breastfeeding? I really noticed that people who were most worried about public breastfeeding were the ones who were less likely to continue to breastfeed. It certainly took me some time to get the hang of, and I was really nervous, but it was so worthwhile, and practicing being discreet at home was a real help. Paired with some really discreet breastfeeding tops (the ones that pull up rather than down make you feel far less exposed) it became something I really didn't think about much at all. 5 - If it hurts it's not working properly. you will hear this everywhere and yet my midwives (yes, more than one of them) still said to me that it was normal. Both of them were lactation consultants (LC's) themselves!!!! Because they were LC's and I was so hormonally and emotionally vulnerable I believed them. And yet I needed help. With my first little guy I battled through and eventually we got there, second time round I got put off by another midwife (again an LC) and so didn't call an independent LC. The very next day I had blisters and felt silly for not having just listened to my own instinct. 6 - If there is pain and someone (an LC or midwife) doesn't help you feel immediately different, find someone else who does or ask for more help from them. Don't battle on with advice that isn't working for you. Every midwife and LC has something different to say, and even if they are saying the same thing as each other they may communicate it better to you than someone else does. If you are in pain you need someone who says things that work for you. Don't feel bad for changing practitioners or worry that it's you and not them, just find the right person for you. Prepare for Breastfeeding - Practical tips for choosing new clothes, getting your breastfeeding area ready and postural advice to ready you for huge amount of sitting and carrying you will be doing. Research published in Pediatrics online shows that there are specific factors which contribute to mothers reaching their goal of breastfeeding. Knowing those factors can really help you to get yourself in the best position possible for exclusive breastfeeding. According to the World Health Organization Guidelines, exclusive breastfeeding is recommended til 6 months of age, and continued breastfeeding is recommended til 2 years of age, in addition to solid foods. Their statistics show though that in most Western countries this is not what occurs. Would you like to birth with confidence? Would you like to learn at home at a time that suits you? The Birthologie classes, at an awesome price of just $47, can help you find your inner calm and help you go into your birth with confidence! Check out their first class for free and see if it's the type of learning that suits you! 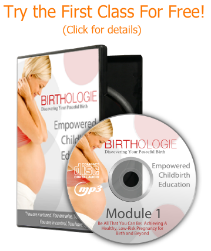 They even include a bonus DVD to help you get ready for breastfeeding, along with the ten classes so you have all the information you need for a natural delivery and successful breastfeeding start.